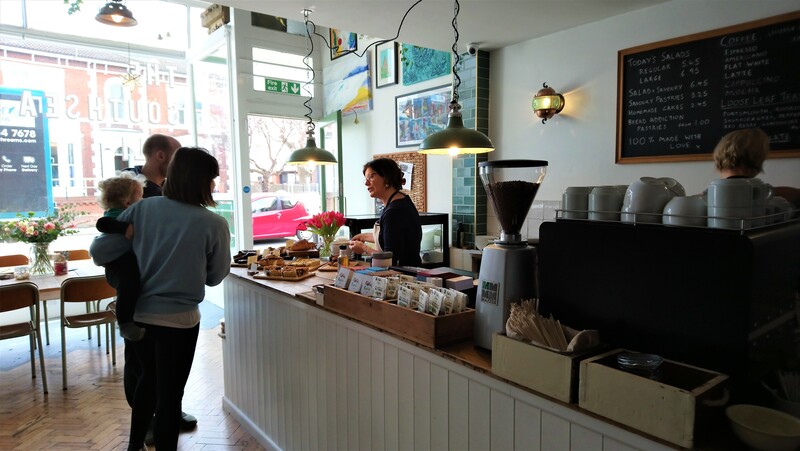 The Southsea Deli opened less than two weeks ago and is a unique place in Southsea – perhaps not for the reasons you may think. Before it was the light and airy deli it is now, it was once Jam and Bowler and then briefly an Alice in Wonderland cafe. It is a refreshing addition to Victoria Road South and rests between the South Coast Emporium and a nail bar. 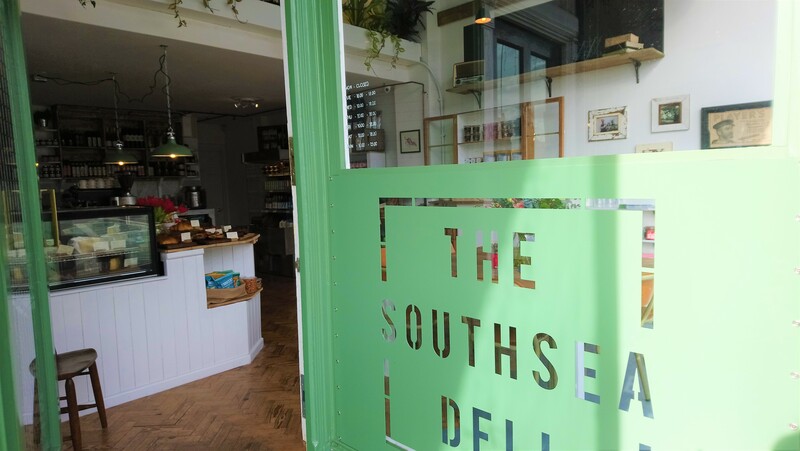 Unlike the nearby pubs and restaurants, The Southsea Deli is a vibrant place with a large pristine window and smart looking decals, shimmering under the burgeoning spring sun. It has a fresh green exterior and inside, it is just as welcoming. 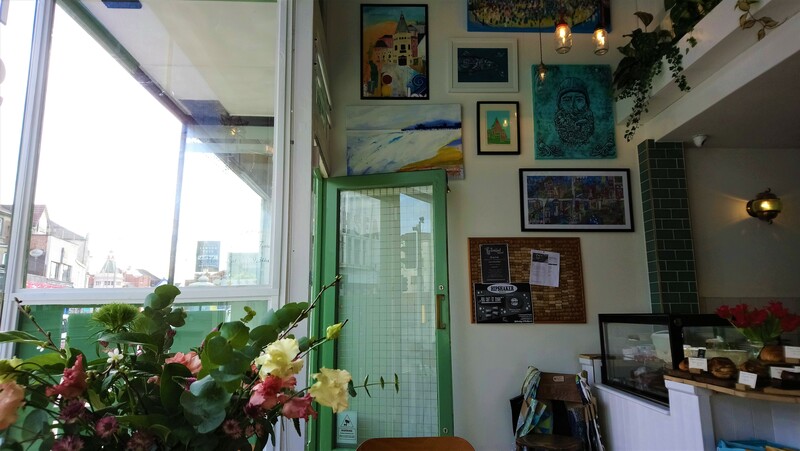 Above your head, you will find potted plants aplenty and artwork from local artists. Immediately in front of you, there is a cabinet with fresh cheeses and a collection of cakes and pastries that are just as tempting. Around the rest of the shop are bowls of olives, jars of oil and sauces and fresh vegetables among other treats you can buy. As I snapped a few photos and spied the goods closely, I noticed that most, if not all, of the items on sale were from local producers. There were pastries from Bread Addiction and ketchup from the Tomato Stall on the Isle of Wight. Even the decor was local with a huge jar of flowers on the one table from Rose Clover. I am sure there were plenty of other local names featured in that shop but there were too many to jot down. The lady behind the til was very kind and chimed out to me as I entered. She told me salads and sandwiches would come down at 12 yet it was just before midday so I scanned the delicacies in front of me. The woman told me what they had on offer from filled croissants to a rich chocolate brownie. There were a few vegan treats too which were nice to see but I had already made up my mind. 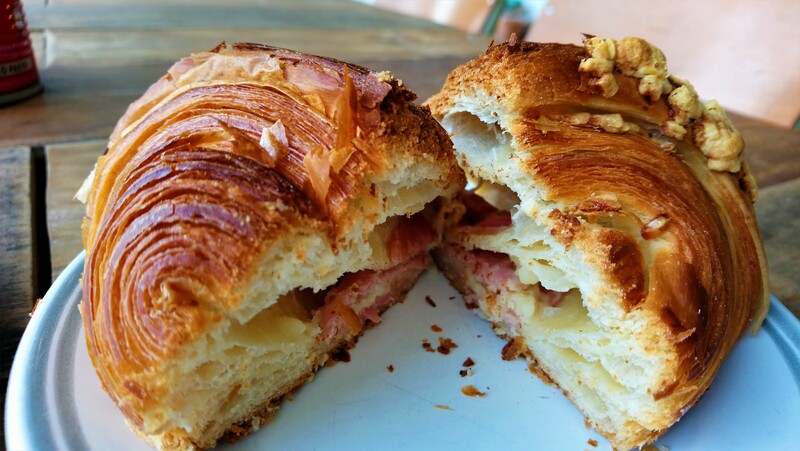 Ordering a Portsmouth tea, I pointed to one of the handmade quiches and a ham and cheese croissant. The cashier smiled, asked if it was to eat in or take away and, after my reply, she sat me down by the window. It was lovely sitting there. There was so much light and the staff were so warm and welcoming. One member, appearing from upstairs, asked me if it was too cold and if it was they would shut the door. I was fine with the breeze so we talked and laughed for a few minutes. Next was the slow-cooked quiche with goats cheese and cherry tomatoes. It was a generous portion with a thick crust and plenty of toppings. I took my fork to it and it fell apart, soft and moist. I put it in my mouth and made a bigger moan than before. It was absolutely gorgeous. The base and crust was buttery and rich and the tomatoes added a tangy sweetness to each bite. Within no time at all, I finished the juicy and moreish quiche and found myself wanting more. I soon finished my tea and on my way to pay the bill, I was quickly distracted by the foody wares around me. I oggled the bowls of fresh olives and antipasti, spied jars of ketchup, vinegars and oils and licked my lips at bags of crackers and other nibbles. What was even better, were small sample pots dotted here and there with accompanying bowls of sourdough. I ate a few pieces with smoked oil and then paid up. The prices were reasonable with the gorgeous quiche costing just over £3. Considering they were from local producers or handmade, I think this is very good. I am always willing to pay a bit extra to support the local community. The only fault with the Southsea Deli, which is not even a fault at all, is that it is not really a cafe. Yes, you can have food and drinks to have in but there is limited space and the food options are limited and are not the most filling. It’s still a lovely little pit stop but what it really is, as the name clearly suggests, is a deli. It gives me the same sort of vibes as Andre’s Food Bar on Osbourne Road. You can go in to take away some snacks or a light lunch or some fresh, local ingredients for your cupboard. Just like the food on offer, the condiments and other goods are reasonable in value with a jar of Isle of Wight ketchup costing £3.15. Of course, it’s not as cheap as Heinz Ketchup but I am sure it would be far better quality. I can definitely see myself returning to buy some more of that lovely quiche or some tasty presents for myself or someone else. But, perhaps not if I am after a wholesome lunch and that is fine. There are plenty of places around for that but none that do what The Southsea Deli does. And, if they did, I doubt they would do it as well. This deli is a welcome addition to Southsea and is a place that makes me proud. Not only are the staff welcoming and the food is good quality, but it supports local companies too from flower shops and artists to bakeries and ketchup makers. 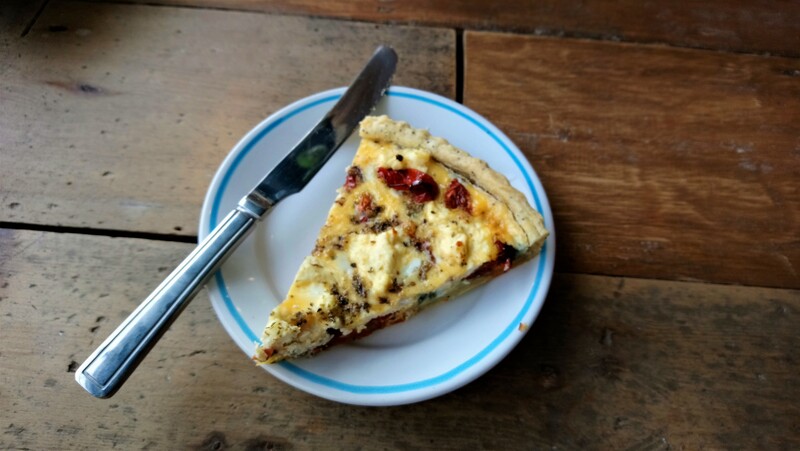 If the quiche is not enough to make you feel good then that definitely will.